My car stereo system starts out with a Sony Mobile ES MDX-C8900 Indash Minidisc player. The MDX-C8900 has three preamp outputs (one is a sub output), 4 volt preout, CD/MD changer controls, BBE sound processing, and a host of other great features. It is a great sounding unit and I would recommend it to anyone thinking of getting an in-dash MD head unit although this model has been discontinued. You can still probably find one on ebay. 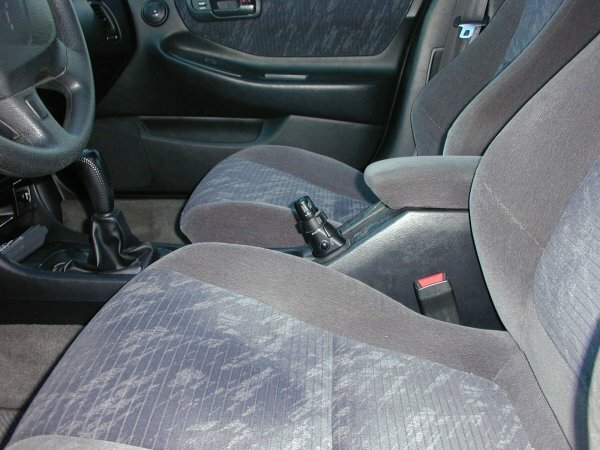 I installed the unit in my car using a Crutchfield Installation kit which made it very easy. The next component is Sony's XDP-210eq. This is a digital 21 band eq, crossover, and sound position aligner. It is controlled by my head unit via Sony's Unilink cable. I installed it under the front-side passenger seat. To connect it to the head unit all you have to do is connect the sub out of the head unit to the master input on the eq. Then you connect the Unilink cable to the head unit and to the eq. So all you have is just two cables (Bus cable & RCA cable) running from the eq to the head unit. You don't even have to run a remote turn wire from the head to the eq because the eq turns on by itself and it has a remote out. You connect the eq remote out to the amps. The EQ has a front, rear, and sub outputs so I just connected them to my amps. I also connected my Sony 10 disc changer (CDX-805) to the eq using a bus cable. The next components along the signal chain are the amps. I am using two amps in my car. My main amp in an Xtant 3300c which is a three channel amp (2x60 + 1x180 watts rms). I am using this amp to drive a pair of Boston Acoustics separates up front and two Kicker solobarics in the rear. I wired the two subs in parallel off the sub channel so the amps "sees" a 2 ohm load. This causes the amp to double its power which allows each sub to receive 180 watts. My other amp is an older Alpine 3547 (2x45 watts) which powers the rear speakers. 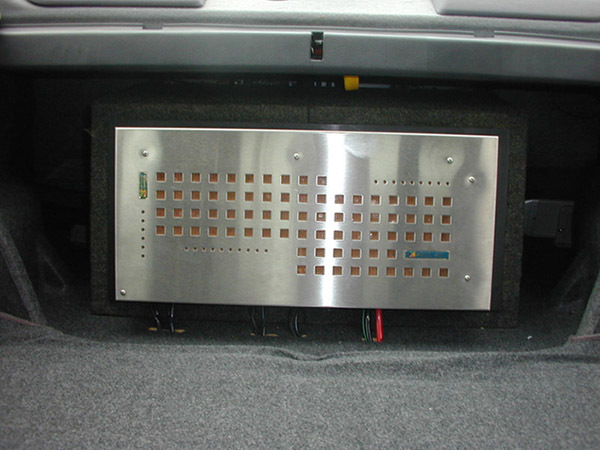 This amp was installed under the driver's seat. 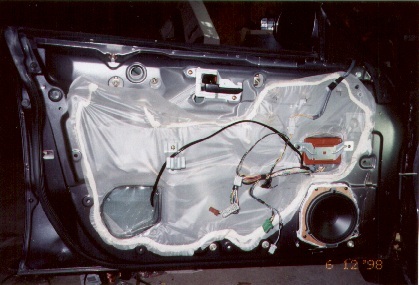 The Xtant amp was installed on the back of the sub box as you can see in the picture. The Xtant amp has a built-in fan which eliminates over heating. For Speakers, I have Boston Acoustics ProSeries 6.5 installed up front in the factory locations. 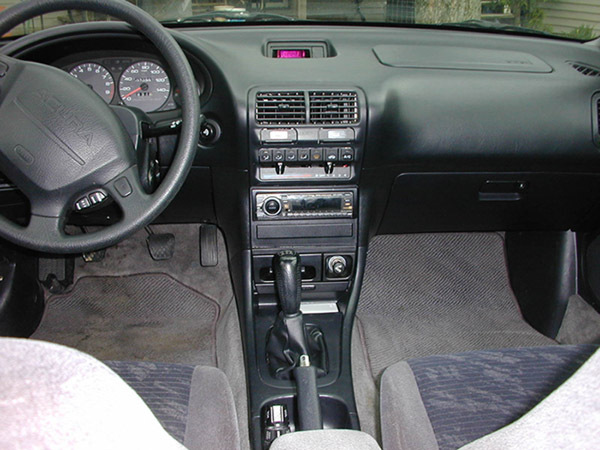 The Acura Integra GS-R comes with factory separate tweeters therefore I didn't have to cut into my door panels which was nice. Installing the tweeters went pretty quick, but installing the woofers took more time. The woofers wouldn't fit in the plastic speaker baffles in which the factory speakers were in. So I used the plastic baffles as templates and traced their shape unto 1/4 inch plywood. Then I cut out the speaker hole on the new plywood speaker baffle and I was ready to go. I mounted the Boston Acoustic Crossovers under the under the front seats. My rear speakers are older Infinity 62 Kappas. 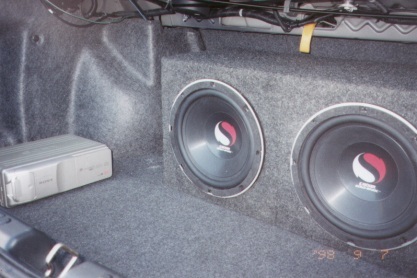 They are 6.5 inch speakers mounted in the rear factory 6x9 openings with some modification. For the low frequencies, I have two 10 inch Kicker Solobarics. I bought them from Crutchfield based on the fact you get free enclosures for them. The Solobarics sound good and tight, but they lack loudness. If you want high SPL then these speakers aren't for you. Also I am only powering them with just 180 watts each which isn't that much for these speakers. I heard if you power them with 250 or more watts they sound awesome. The 10 inch solobarics only need .66 cubic feet of space each which is great, but the downside of these speakers is their inefficiency. I used 4 gauge Phoenix Gold Power cable and interconnects throughout my system. 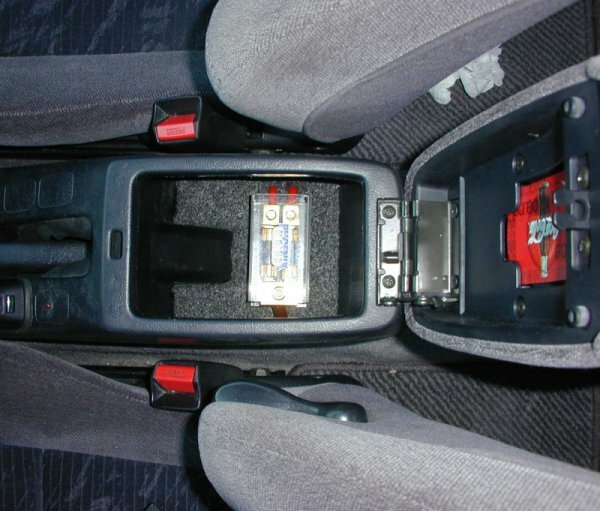 I installed a two output Phonenix Gold fuse distribution block in the center console of my Integra. As for speaker wire, I used Streetwires 12 and 14 gauge wire. 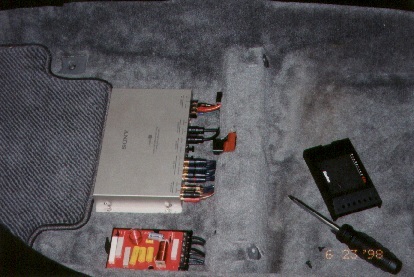 Lastly, the Sony head unit came with a wired remote which installed on the center console. I love this remote and could never see myself using a wireless remote. The permanent mounted remote is very intuitive which makes it very easy to control the head unit. I will always buy Sony head units just because they come with the wired remote.